This is a full and authoritative account of the history of private banking, beginning with its development in conjunction with the world markets served by and centred on a few European cities, notably Amsterdam and London. These banks were usually partnerships, a form of organization which persisted as the role of private banking changed in response to the political and economic transformations of the late 18th and early 19th centuries. 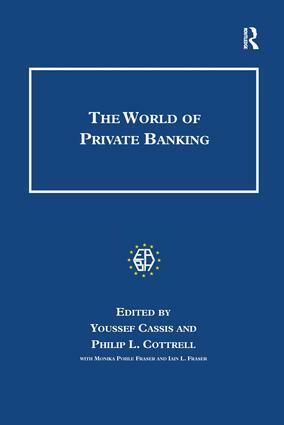 It was in this period, and the succeeding Golden Age of private banking from 1815 to the 1870s, that many of the great names this book treats rose to fame: Baring, Rothschild, Mallet and Hottinger became synonymous with wealth and economic power, as German, French and the remarkably long-lasting Geneva banks flourished and expanded. The last parts of this study detail the way in which private banking adapted to the age of the corporate economy from the 1870s to the 1930s, the decline during and after the Great Depression and the post-war renaissance. It concludes with an appraisal of the causes and consequences of the modern expansion of private banking: no longer the exclusive preserve of partnerships, the management of investment portfolios of wealthy individuals and institutions is now a major concern of international joint-stock banks. Contents: Introduction; The rise of the Rothschilds: the family firm as multinational, Niall Ferguson; The Rothschild archive, Victor Gray with Melanie Asprey; Private banks and the onset of the corporate economy, Youssef Cassis; London's first 'big bang'? Institutional change in the City, 1855-83, Philip L. Cottrell; Banking and family archives, Fiona Maccoll; The Anglo-American houses in the 19th century, Edwin J. Perkins; The Parisian 'haute banque' and the international economy in the 19th and early 20th centuries, Alain Plessis; Private banks and international finance in the light of the archives of Baring Brothers, John Orbell; German private banks and German industry, 1830-1938, Dieter Ziegler; Private bankers and Italian industrialisation, Luciano Segreto; Private banks and industry in the light of the archives of Bank Sal. Oppenheim Jr & Cie, Cologne, Gabriele Teichmann; Jewish private banks, Ginette Kurgan-van Hentenryk; Protestant banking, Martin KÃ¶rner; Private bankers and philanthropy: the City of London, 1880s-1920s, Pat Thane; Hereditary calling, inherited refinement: the private bankers of the City of London, 1914-1986, David Kynaston; Bibliography; Index. Studies in Banking and Financial History is published in association with the European Association of Banking and Financial History, and publishes single-authored and edited volumes, of the highest quality, on the history of banking and other financial institutions. The series explores all periods of history, in all areas of the world.